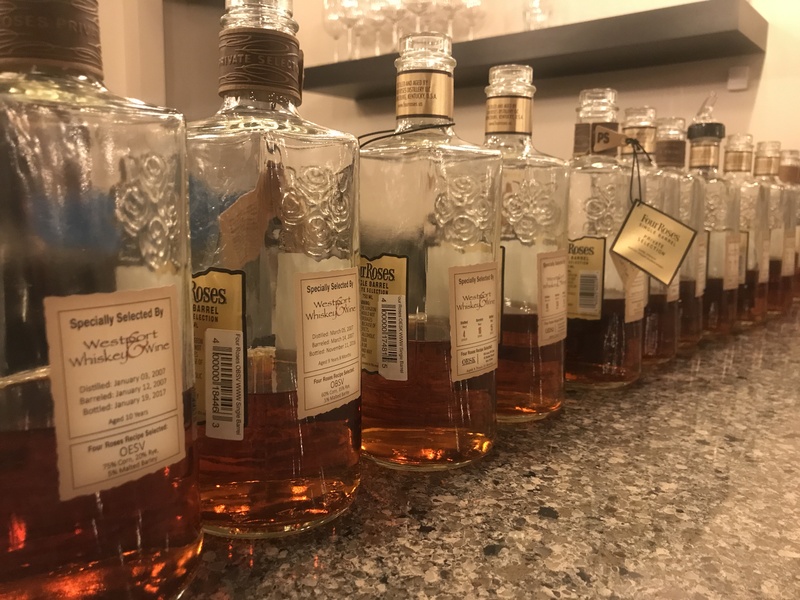 All 10 Four Roses recipes for my tasting pleasure! Last week, I got the opportunity to attend a unique bourbon event hosted by Westport Whiskey & Wine and Four Roses. I hope you’re not cringing at my use of “unique” — we all know it is an overused term. But it’s the one word that is coming to mind when trying to describe the experience. Perhaps one-of-a-kind or exclusive would be better? Whatever adjective you prefer, it was fun, eye-opening and highly informational. 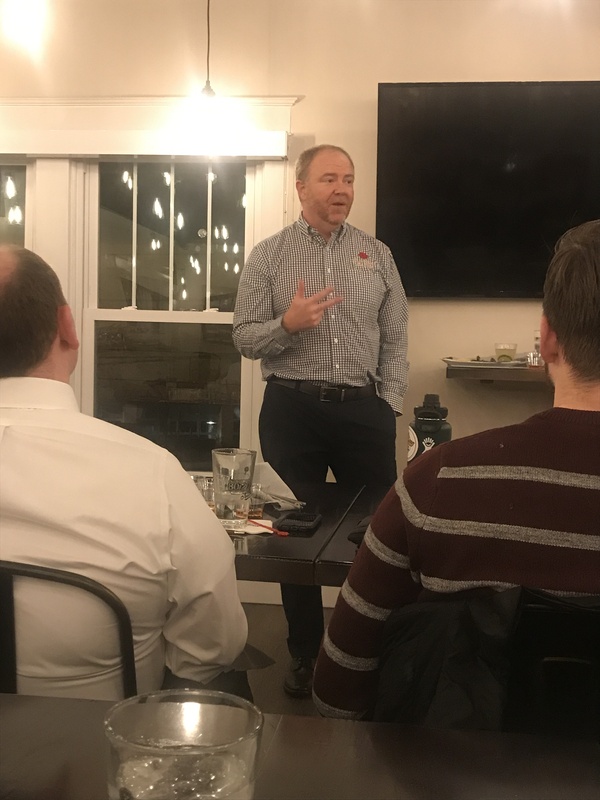 I learned which Four Roses recipes I tend to prefer, because we got the chance to sample ALL OF THEM! You see, Four Roses is unique — crap! There it is again — because it has five different yeast strains and two different mashbills. This creates 10 distinct recipes, which they either blend together for the Yellow Label and Small Batch releases, or pick one (OBSV) for their single barrel release. 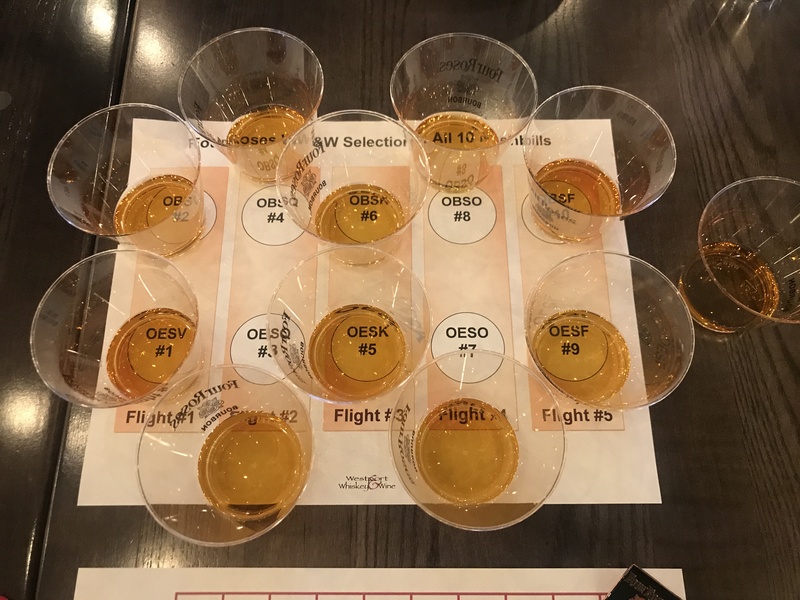 Some Four Roses bourbon nerds know the ins and outs of each of these recipes because they’ve had the fortune to sample them either at an event at the distillery or by tasting different private single barrel picks. Now, I’m happy to report I’m one of these said bourbon nerds. Woot! The recipes are listed using four letters, and they’ll either start with OE (E is for the mashbill that uses less rye) or OB (B — the mashbill with more rye), followed by an S, and then the letter dictating which yeast strain it is, which could be V, K, O, Q or F.
If I haven’t lost you yet, I’ll just say that one of my favorite samples from the night was a 10-year-old OESV, and I tended to prefer the OE mashbill throughout, except on one occasion. Four Roses Master Distiller Brent Elliott led the sampling. One might think after 10 samples I would have forgotten all of this, but I took notes, dammit! Anyway, it was a fun experiment, and it was hosted by Kaelin’s 80/20, so we got to eat some fine food as well. Four Roses’ privately selected single barrels will usually list the recipe on the bottle, so next time you come across one of these — either at the distillery or at a liquor store that helped select the bourbon (Eh em, like Westport Whiskey & Wine) — pay attention and do your own little taste test. Again, the regular single barrel is OBSV, so go from there and write down what you think. Or just drink them all and call it a day. So glad you were able to make it to this. I’m bummed I missed it! My favorite is always the OBSF and I’m always partial to the OB’s. Sounds like you had a great time.